Welcome to jobaffairs4u, UGC NET 2018 Examination notification is rolled out by CBSE. The Central Board of Secondary Education (CBSE) will be conducting UGC NET 2018 on July 8, Sunday. In a short notification, the board has announced the revision of exam pattern and eligibility criteria. Candidates who clear the paper will be eligible for a junior research fellowship or can be considered for the post of assistant professors. Registrations for the regarding National Eligibility Test 2018 will begin from March 6 and will continue till April 5. — Instead of 3 papers, there will be only 2 papers – paper 1 and paper 2. — Paper 1: It will be of 100 marks and will contain 50 objective type compulsory questions. 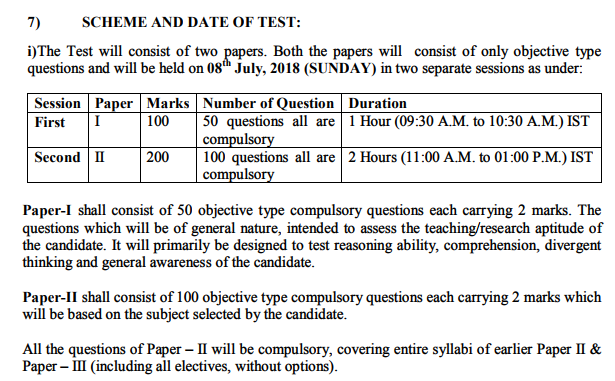 Each question will carry 2 marks and will be of general nature and will test the teaching/research aptitude of the candidate.The duration of the same will be one hour (9:30 am to 10:30 am). — Paper 2: It will be of 100 marks and will contain 100 objective type compulsory questions. Each question will carry 2 marks and will be based on the subject opted by the candidate. The duration of the same will be two hours (11 am to 1 pm). — Age limit increased: The age limit has been raised by 2 years. Earlier, the upper age limit for appearing for JRF was 28 years, but now, it has been increased to 30 years.